Imagine a time when Muslims, Jews, and Christians found a way to live together in peace. Sound unbelievable? It is historical fact. Convivencia (coexistence of religions) is a largely forgotten triumph of al-Andalus (a catch-all word for the lands of medieval Muslim Spain). Peaceful coexistence between Muslims, Christians and Jews occurred in al-Andalus for nearly 300 years beginning in the 10th century. During the Castilian Civil War (1367-1369), Muslims even took up their swords and fought alongside Christians. By the 13th century, the Christian kingdoms are mid-stream in their attempted reconquista (reconquest) of al-Andalus, having conquered Córdoba in 1236, Valencia in 1238, Murcia in 1243, and Sevilla in 1248, slowly but surely pushing the Moors into the Mediterranean Sea. (The Muslims of Spain, regardless of ancestry, are known collectively to Europeans by the term “Moors”.) The Kingdom of Granada is the final holdout of al-Andalus, a mere one-hundred mile wide swath of land at the extreme southeastern tip of Spain, stretching from the coast north of Mojácar, through Málaga, to Gibraltar. Under the moderate Arab Nasrid clan, who rule from Alhambra Palace, the kingdom prospers, and by the 1360s Granada, under Sultan Muhammad V, remains a stubborn bulwark against Christian reconquista. Improbably, Granada is allied with the Muslim Marinid Empire of North Africa and is also a tribute-paying vassal state to the Christian Kingdom of Castile, ruled by King Pedro from Sevilla. Tensions that have smoldered for decades between Castile and her Christian neighbors finally boil over. Pedro’s illegitimate brother, Enrique of Trastámara, is championed by the king of Aragon, who lusts after a unified Spain under Aragonese rule. Enrique is supported by King Charles V of France and even the Pope himself, who is presently in Avignon, itching to help cleanse Spain of infidel Moors. Enrique brashly declares himself the “true” king of Castile in 1366. The Castilian Civil War becomes a death match between Pedro and Enrique, brother against brother. Enrique assembles a large army consisting of Aragonese, French, and Breton troops, supplemented by a diverse collection of mercenaries, and invades northern Castile from Zaragoza, the capital of Aragon, forcing the unprepared Pedro to abdicate the Castillian throne without a major fight. Pedro gathers his meagerly funded troops and retreats from Sevilla to Galicia, in northwestern Spain, where he begins frantic preparations for war. Meanwhile, England’s Sir Edward of Woodstock (Edward the Black Prince), in an attempt to head-off France’s thinly-veiled ambitions in Spain, as well as attempt his own land-grab, weighs in behind Pedro, and the Hundred Years’ War creeps south into Iberia. Sultan Muhammad of Granada, as vassal to Castile, walks a thin line between the warring brothers, but in the end, agrees to send 600 of his best cavalry to support Pedro. Pedro’s ragtag army of 28,000 English, Castilian, Gascon, Aquitainian, Majorcan, and Muslim troops clash decisively with Enrique’s superior army of 60,000 at Nájera, in the Rioja region of northern Spain, on a fine spring day, the 3rd of April, 1367. Among Enrique’s officers is Sir William Chandon. A strapping twenty-five year old, Chandon brilliantly leads the forces of Jean de Monfort from Brittany to victory over the House of Blois at the Battle of Auray in France in 1364, winning the Breton War of Succession, a linchpin in the Hundred Years’ War. As a reward for his valor at Auray, Monfort appoints Chandon Viscount of Saint-Sauveur in the Cotentin, Brittany, where he settles, a suddenly-landed, wealthy English knight living now as a Breton on French soil. At the request of the King of France, Chandon’s cavalry rides with Enrique. The famous English longbow makes its first appearance in Spain at Nájera. Edward the Black Prince’s twelve thousand English longbowmen first overwhelm the French archers then train their arrows on Enrique’s cavalry, to devastating effect. Enrique’s Aragonese and French cavalry units panic and turn tail, leaving his flank and rear dangerously exposed. Edward the Black Prince strikes like a hammer. Enrique’s force of 60,000 is quickly routed, with losses of 7,000 dead to Pedro’s 200. Enrique and his whipped forces limp back to Zaragoza to lick their wounds and regroup for round two of the fight. Pedro settles back into his palace in Sevilla, supremely confident. Eight days later, on 11 April 1367, a Moor courier in transit from Granada to Sevilla is intercepted in Carmona and his throat slit. In his satchel is an official communiqué from Sultan Muhammad to King Pedro, declaring that Granada, empowered by Pedro’s decisive victory at Nájera, will seize the opportunity to strike north through Jaén and invade the former Castilian border lands presently occupied by Aragon. Made aware three days later of this bold and unexpected move by the Moors, Enrique, fearing a two-front war, summons Chandon and sends his elite Breton cavalry south to bolster the garrison of Castillo de Santa Catalina in Jaén, only forty miles north of Granada. Enrique’s instructions to Chandon are simple - send an emphatic message that Aragon is off limits to Moor meddling. 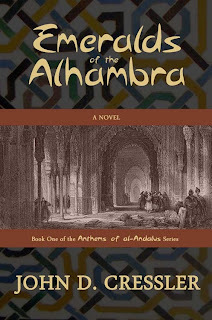 My novel, an interfaith love story entitled Emeralds of the Alhambra, begins here with the Breton-Moor battle for Jaén. John D. Cressler is giving away a signed paperback copy of the book in a drawing HERE. Dr. John D. Cressler spent 8 years at IBM Research and 10 years at Auburn University before joining Georgia Tech in 2002. 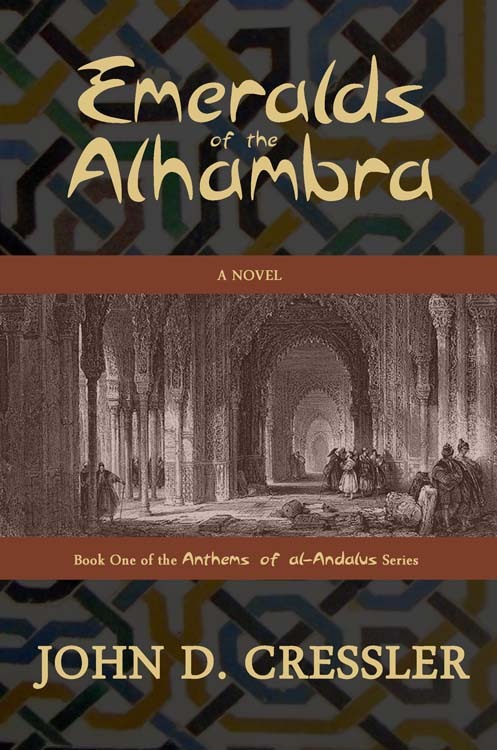 Emeralds of the Alhambra is the TED talk presenter’s debut novel. Connect with John on Facebook, Google+, Twitter, and GoodReads. I'm intrigued. This period of history is fascinating, even with the horrors that accompanied it. Excellent book trailer, by the way. Will most definitely be purchasing this book. This is a new piece of history to me and an exciting bit at that. Thanks for sharing! Thanks so much, Darlene and Sophia! It is a too-little-appreciated period of history that has great relevance for our world. I am so excited to have found this book. The time of 'Moorish Spain' is really my favorite period in history. It proves that people can live together no matter what their faith or background is. I am looking forward to reading it, but can't find it at my local store!